Thank you for considering Bonnet Pro. We know you have many choices available to you, so we strive to make products you will see as your best choice. For instance – our proprietary T2H hybrid encapsulation polymers that help carpets stay cleaner longer and won’t give your customers a negative — crystallizing encap dust. T2H helps promote clean. Safer raw material choices. We could choose less expensive raw ingredients that would yield a higher profit, but they are not the healthy choice for you, so we won’t use them. Education. When you call us, our goal is not to sell you but to educate. We find an educated customer is our best resource for a long, sustainable relationship. Once you get to know us, you too will realize our goal is to serve you, not to sell you. One stop shop. You need a wide range of quality items for your carpet cleaning operation. You will find everything you need right HERE. Products, education and services. Bonnet Pro is a Christian run family business with part of our income going to Compassion International, TRW and Voice of the Martyrs. I use my more than 30 years of cleaning experience to ensure that my products are the best products available. I personally field tests all of Bonnet Pro’s products. We never rest in this competitive market, and constantly strive to bring you the most innovative, best performing, best smelling and safest products possible in my commitment to serve you, our valued customer. My goal is to make you the cleaning legend in your town. That Jesus did come and die, even for one like me. 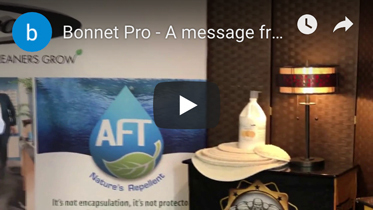 Why Buy Bonnet Pro Encap Products? Picture from lab session for the Surround and the Electron Microscope article, shown with John H. Klucznik, founder of Bonnet Pro (standing). For more on his background click here. To see the highly informative test results click here.